What Can You Clean With Stanley SHP2150? Stanley Tools is a competitive manufacturer in the field of commercial gardening and cleaning power tools. They offer a versatile pressure washer unit that can satisfy the needs that any household may have. In the next sections, we will provide an objective Stanley SHP2150 review, and help you understand this unit better, together with its mechanisms. We will put this unit`s performance to the test, and share the results with you. 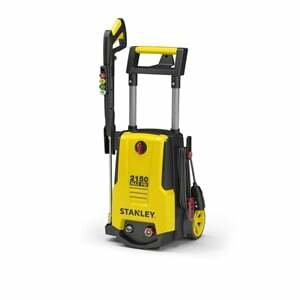 Stanley SHP2150 is a power washer unit that exerts the force of 2150 PSI at 1.4 GPM, making its total cleaning power at 3010. This is considered to be low to the medium-duty power washer, which will satisfy the needs of standard users. The unit has a 13-amp electric motor conveniently placed in a beautifully designed, modern looking housing. The whole housing of the best pressure washers is mounted on 2 rubberized plastic wheels to help you get around, and it weighs a total of 26 pounds, which is considered lightweight in the power tool category. Portability of this unit is supported further by a 25-foot long high-pressure hose, and a 35-foot long electric cord, enabling you to reach the toughest of spots. Additionally, you can grab the washer by the handle and carry it around with ease, due to its lightweight. There are 4 quick-connect nozzles provided, together with the nozzle holder mounted on top of the spray gun. With these nozzles, you can simply adapt the pressure output to the task at hand. You can even use the cleaning agents to attack sturdier stains on the surface you`re cleaning. That said, this model comes with a detachable foam cannon, which is a great help if you decide to combine the pressure force with soap. This is ideal for car washing and for stained concrete. When you are finally done with cleaning, the handle on top of the washer can be compactly lowered in order to save you storage space. Handles for reeling the cord and the hose are mounted on the side, and there’s even a holster for the spray gun. These properties combined with the low weight give you the true sense of portability. Stanley Tools provides 24-hour customer support, even when the warranty expires. Online support and website are quite user-friendly and easily-accessible, and additional info is provided. The company gives you a 1+1-year warranty policy, with the first year including every kind of replacement for the motor and accessories, and the second year covering only manufacturer defects. This is by far the best deal when it comes to pressure washer warranties because the additional equipment is usually the first to break down. This medium-duty electric pressure washer will help you tackle everyday tasks around the yard, like seasonal cleaning and furniture maintenance. You can easily get rid of oil, tar, moss, grime, and dirt. With the soap cannon extension, this unit is ideal for detailed car washing and removing any kind of oil-based stain. It is also quite useful when it comes to cleaning surfaces such as wood, marble, stone, glass, and metal. Nevertheless, considering this is a medium-duty washer, it cannot deal with the most stubborn stains. Stanley SHP2015 is incredibly portable and compact, and it can be stored without taking any extra room. It also supports standard garden hose size, which is quite convenient because you do not need to purchase any additional connectors if your hose cannot fit. Last, but not least, there is a maintenance kit provided with this power washer unit, enabling you to prolong its life and keep it as a part of your power tool collection for a long time. This washer does not have a pressure controlling system, besides the nozzle changes, which can sometimes slow you down. But, because it is a medium-duty unit, no harm can be done to more sensitive surfaces. If you need to do tasks like general cleaning around the house, yard, and driveway, this pressure washer can be the right solution. Everyday chores are done with ease, and soap cannon will save you a lot of time with car washing. Even though it can`t match heavy-duty washer, this unit has all it takes for a fast cleaning session, and it comes at a great price, which with its portability is another great perk. We hope that this Stanley SHP2150 review helped you get to know this model better. If you happen to have any extra questions, feel free to ask them in the comment section below.